Generally caused by a fall on the outstretched hand causing forcible hyperextension of the MCP joint. Volar dislocations may result from hyperflexion injury. Index finger is most frequently involved, followed by the thumb. The volar plate is avulsed from its metacarpal neck attachment during dorsal dislocation and may become interposed within the joint preventing reduction. Other structures may also prevent reduction: lumbrical muscle, flexor tendons, natatory ligament, superficial transverse metacarpal ligament. Proper collateral ligaments are the primary stabilizers of the MCP joint: taut in flexion, lax in extension. the volar plate; taut in extension and lax in flexion. Volar plate: thick fibrocartilaginous portion distally and a looser, membranous portion proximally. A/P, lateral and oblique xrays of the hand demonstrate dislocation to the MCP joint. Complex dislocation: proximal phalanx nearly parallel with the metacarpal. Palmar plate, is entrapped in the MP joint. Requires open reduction. The palmar plate is incised longitudinally through its midline, allowing the metacarpal head to be reduced. Simple dorsal dislocation: proximal phalanx is nearly perpendicular to the joint. Reduction: wrist is flexed to allow relaxation of the flexor tendons. Distal traction as well as volar-directed pressure to the base of the proximal phalanx generally provides reduction of a simple dislocation. Becton JL, Christian JD Jr, Goodwin HN, Jackson JG 3rd. 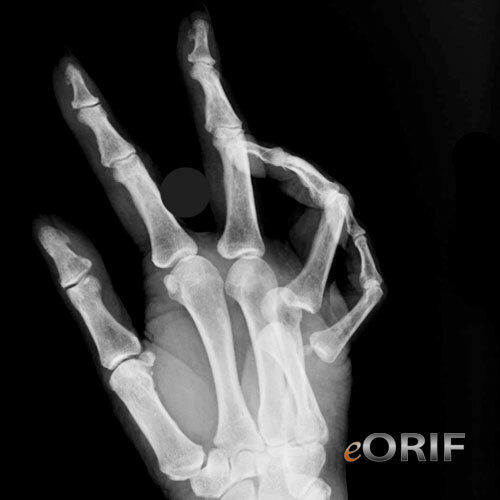 A simplified technique for treating the complex dislocation of the index metacarpophalangeal joint. J Bone Joint Surg Am. 1975 Jul;57(5):698-700. Green DP, Terry GC. 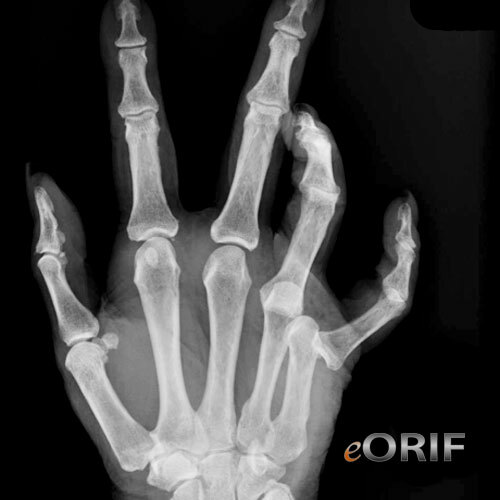 Complex dislocation of the metacarpophalangeal joint. Correlative pathological anatomy. J Bone Joint Surg Am. 1973 Oct;55(7):1480-6.